The main garden lighting workhorse for focused spotlighting or uplighting for many years has been the halogen reflector lamp. The most popular types are those using the 12v MR16 halogen reflector lamp, as this type provides the widest selection of wattages and beam angles. MR16 lamps are available in a wide choice of wattages and beam angles from 12 to 60 degrees, which gives the designer much more choice in accurately and precisely lighting subjects without spill or glare. Standard halogen lamps are now being replaced with Powersavers - high effiency halogen lamps which provide a much higher output for the same power. For example, a 35w Powersaver halogen lamp gives the same light ouput as a standard halogen lamp. For even greater energy saving and long lamp life, the latest generation of led (light emitting diode) lamps provide reliable operation and are providing a choice of the two most popular beam angles for garden lighting - 36 and 60 degrees. For designers of garden lights, the appeal of such a wide range of lamp choice is reinforced by the small size of an MR16 lamp: it is less than half the diameter of a PAR38 lamp and about one-tenth of its overall size. The result is garden lights which can be much smaller and yet produce more light than old-fashioned tungsten fittings. The majority of directional garden lights supplied by Lighting for Gardens are 12v halogen spotlights and uplights which are connected to a remote surface-mount transformer hidden behind a landscape feature or at the back of the border or a ground burial transformer. Flexible rubber sheathed cables run between plants and under the mulch – they don’t need protected buried cables like 240v lights and so 12v lights can be moved around to give much more flexibility as the garden grows or alters. 240v spotlights are sometimes an advantage for areas where a transformer for a odd spot or two can’t be easily hidden or buried, or where they are replacing older Par38 240v spotlights of the open-lamp type, which fail with monotonous regularity as the hot lamp perishes the rubber seal between the lamp body and the plastic holder. 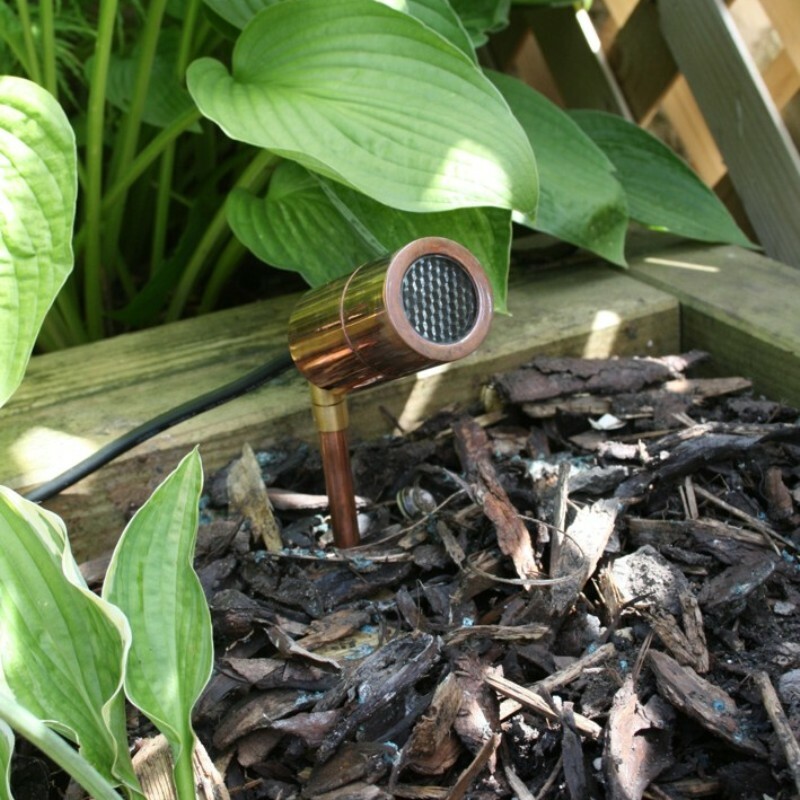 Elipta’s high quality COMPACT spike spotlights are available in 240v GU10 versions in black, dark green (which is especially unobtrusive amongst planting), copper and 316 grade stainless steel. Using an 11w or 13w compact fluorescent spotlamp in a Compact spike spotlight is an effective way or reducing energy consumption when replacing PAR38 lamps, achieving energy saving of over 80%. 12v MR16 COMPACT spike spotlights include the single spike spotlights in black, dark green, rustic brown, copper and 316 grade stainless steel - the black and rustic brown spotlights which can be converted to a strap-mounting tree spotlight for "Moonlighting" down from trees. A finned Ground anchor is available for firm location in loose soils, while interchangeable 25 cm spike extension cater for different positioning heights amongst seasonal planting. Microspot Spike provides a miniature 20w option for location in urns, planters and small planting pockets. Recessed uplights are a different category altogether and lack the flexibility of movable spike spotlights, which also don’t get covered by garden litter or plant growth either. Patilo’s Universal spike spot is a versatile budget-priced product: it is made from cast aluminium, complete with a finned ground spike and a screw-lockable adjustment knuckle to help hold the fitting in position despite gardening and children’s games, and is fitted with a glare guard as standard.